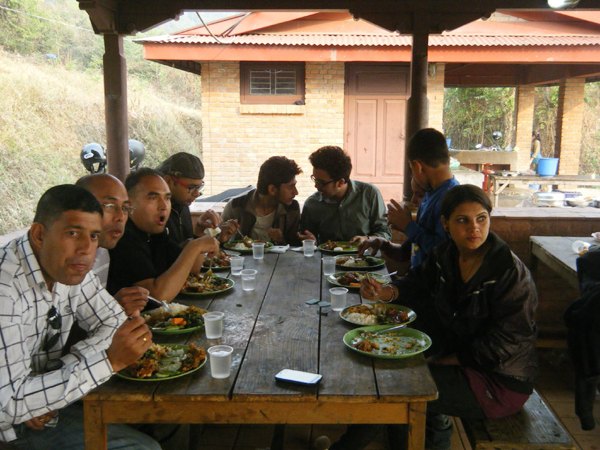 On April 6, 2013, Pax Earth organised a picnic program for members and well-wishers at International Training Centre of Nepal Scouts situated at Kakani VDC of Nuwakot district of Nepal after two year’s gap. Given the theme “Be freshen,” the picnic aspired to provide refreshment for the participants away from their busy and hectic schedules in a dynamic natural environment. Beating the expectations of the picnic organising committee, including seven females and six kids fifty five persons attended the picnic. Kakani lies about 25 Km northwest of Kathmandu (i.e. one and half hour of driving from Kathmandu) at an altitude of 2000m above sea level. 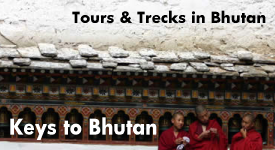 It offers a magnificent view of majestic peaks stretching from Ganesh Himal to Annapurna and Dhaulagiri ranges of Himalayas. Many travel to this place to enjoy sunrise and sunset. There is an unusual perfect blending of the imposing mountain scenery with the more sylvan environment of the lower valleys. Located amid such a magnificent environment, the International Training Centre offers an excellent recreational destination for all people. The centre is well equipped with facilities including access to water, electricity, toilets, kitchen equipments and dining halls. Hence, the spot is quite suitable for enjoying natural setting and adventure. As per the plan, the members and well-wishers gathered at Mitrapark in the morning. The organising committee members were expecting about forty participants and accordingly arranged a forty seated bus. However, the committee members were surprised to see above fifty people ready to go for the picnic. At the eleventh hour, it was neither easy to change nor to add the vehicle so adjusting all in the same bus, they headed for the picnic spot at 8:00am. The one and half hour journey from Kathmandu to Kakani was enthralling with the green fields, forests and mountain scenery. They arrived at the spot at 9:30am. It was like the majestic White Mountains in the northern part were welcoming us. The weather was sunny and bright and a tender breeze was there to keep it cool. The participants, then, gathered for the introduction. 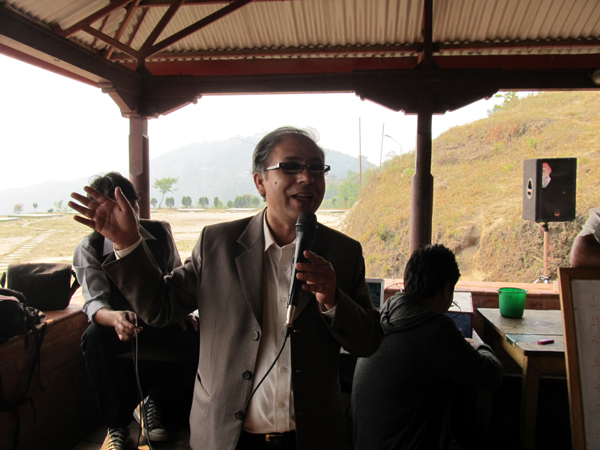 The coordinator of picnic organising committee Bal Gopal Shrestha introduced the picnic and also gave a brief self-introduction. One by one all the participants gave a brief self-introduction respectively so as to ice-break with each other as the participants were from different parts of the Kathmandu valley. After a bit relaxation at around 11:30am, the Malla Catering team headed by well-wisher Ashok Malla offered breakfast for the participants who were already hungry because of the one and half hour’s journey. In the breakfast, each participant was served cheese pasta, boiled eggs, and teas/coffees. The DJ duos Niraj Rijal and Sangharsha Rijal took no time in setting the multimedia. Listening to the varieties of music mixed by the DJ duos, the participants enjoyed the breakfast. After the breakfast, it was the game time. First game was the “Handi futaune khel” (breaking the clay-pot). In this game, the participant is blind folded and handed a stick and s/he has to break a handi (clay-pot) put in a spot. 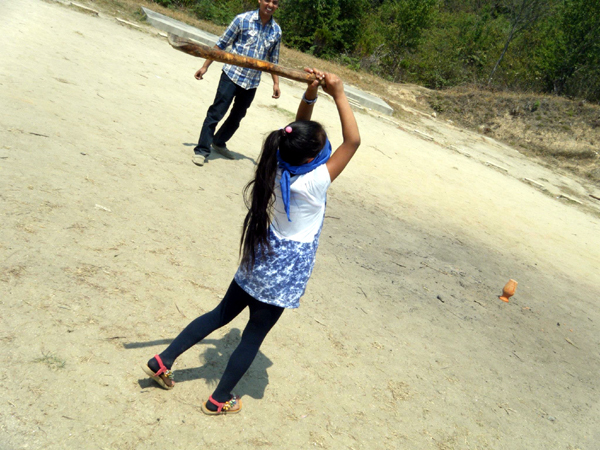 Starting with Manisha Chalise, twenty-three persons including few kids took part in this game. Out of twenty-three, just three persons: Akhilesh Jha, Sumit Shrestha and Ojaswi Karki could succeed to break the handi in 18 sec., 30 sec. and 37 sec. respectively and stood first, second and third. This interesting game was smoothly coordinated by President Sujan Koirala, Secretary Binod P. Mainali, Joint Secretary Guna Raj Pyakurel and Member Sudan P. Bhandari. The next game was “Who am I?” In this game, each participant was given a name anything and put in the forehead. S/he has to guess the correct name. As per the need, s/he is given the cryptic clues by the audiences and s/he should guess it within a time frame or a certain attempt. Six persons: Reetu Adhikari, Jamuna Siwakoti, Nilambar Badal, Rajiv Khatry, Ram Sharan Paudel and Laxman B. Pahari respectively participated in this funny game. The game was well coordinated by Honarary Member Nilambar Badal and assisted by President Sujan Koirala. At 12 noon, it was the snack time and everyone gathered at the serving area. The catering team came up with mushroom chhoyla, potato chips, chicken chilly, buff chhoyla, green salad, beaten rice, and pickles. Along with the snacks, some began to play cards, some were enjoying the scenery, few were taking snaps, and few even started to take sip of cold drinks, whiskey, beer and local strawberry wine. The snacks were very delicious and everyone enjoyed a lot. Thanks to the effort of well-wisher Manish Narsariya, even some were fortunate to play the cricket for some time. The DJ duos Niraj and Shangarsha invited all for DJ session and started mixing various blends of music particularly Nepali, Hindi and Western. The atmosphere was so electrifying that the participants could not resist them from hitting the dance floor with their dancing steps. The DJ session continued for nearly two hours. During the DJ session, Sachin provided fabulous entertainment with his few hit numbers. The participants were quite lucky to see respected Yubaraj Nayaghare, a renowned essayist, who could manage to join the picnic for a while. He was quite happy to see the unity and solidarity among the members and the well-wishers. He highly encouraged the Pax Earth members to continue supporting poor and underprivileged children in Nepal. He further wished for the success, growth and prosperity of the organisation in the days and years to come. 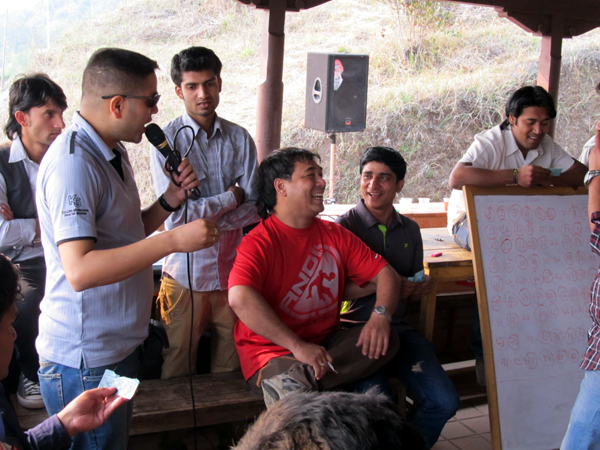 The excitement got further momentum when President Sujan Koirala announced the beginning of the most awaited “Bingo”. 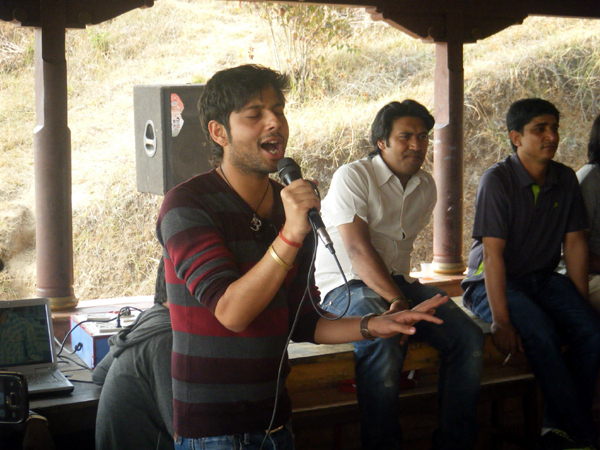 Led by President himself, the Bingo team (Guna Raj and Ashok Poudel) conducted the whole program excitingly. Each time, when a number was picked and about to announce, the heartbeat and the voice of the participants reached at the highest level. What a lucky day for well-wisher Supendra Raj Bhandari for winning quick five, first row, second row, third row and the full house. The one hour long Bingo program ended at 4:15pm. Congratulations Supendra!!! After the thrilling Bingo, the catering team served the lunch: green salad, plain rice, lentils, spinach, chicken curry, and pickles. The dessert “fruit salad” was also served at the end. The lunch and the desserts were quite delicious. 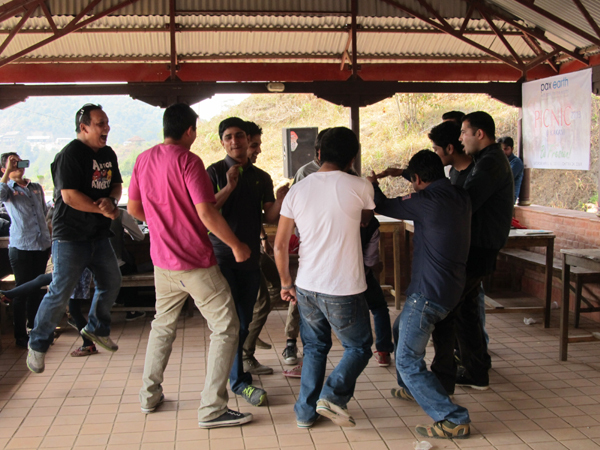 The DJ session resumed even after the lunch. Some kept on capturing memorable moments in their cameras. The time passed so quickly they even did not realize it was already 5:30pm. Then, bidding farewell to the picnic spot, the picnic team again gathered at the station and left for Kathmandu in the same small bus. 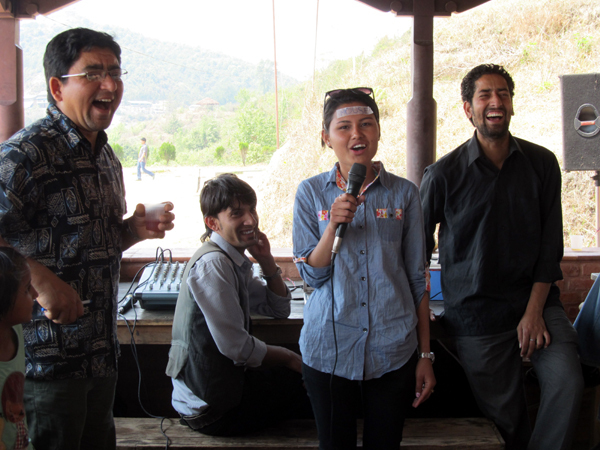 The singing and dancing continued even in the journey back to Kathmandu. The excitement came to an end after arriving in Kathmandu. It’s already 7:45pm while they arrived at Mitrapark. The picnic was very exciting and memorable, and turned out to be a very grand event. It would not be a success without the hard-work and sincere efforts of few individuals. Pax Earth, first and foremost, would like to thank all the participants for their appreciable participation and support for making it a grand event. Due to the last moment’s excessive participation, the picnic organising committee could not avail a comfortable travel especially to those standing in the bus. Sincere apology to all the participants for such discomfort. Despite this fact, Pax Earth believes that every participant must have managed to enjoy the picnic at the fullest. Pax Earth would also like to thank Yubaraj Nayaghare Sir for his valuable presence and inspiring thoughts. Special thanks to Ashok Malla and all staff of Malla Catering for serving delicious meals throughout the day ranging from breakfast to lunch. Pax Earth is equally thankful to all game and Bingo coordinators. Camera person Kumar Nagarkoti also deserves a special thank so as the DJ duos: Rijal brothers. Last but not the least, Pax Earth highly appreciates the role played by picnic coordinator Bal Gopal Shrestha and remaining members of picnic organising committee: Guna Raj Pyakurel and Laxman B. Pahari for managing the whole picnic brilliantly. To sum up this picnic in a sentence, it was “a well blend of friends, music, dance, singing, games, cards, bingo, cricket, foods, drinks, hike, snaps, excitement, and freak out in a natural environment.” According to the theme “Be freshen,” it is believed that this picnic could provide refreshment for all the participants away from their very busy and hectic daily schedules in a dynamic natural environment. In addition, this picnic has provided a platform to discover new friends and enhance friendship among the members and well-wishers. 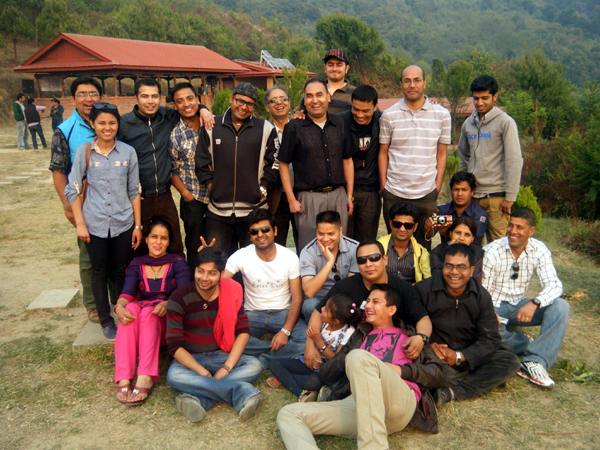 Every participant is looking forward to the next picnic in a new destination in the near future excitedly.